A new tank game with new mission to accomplish. Drive your tank and shoot all the enemies to exit the path. Earn money with every mission. Purchase new tank in upgrade store. Watch your health bar. Good luck soldier! - Use arrow keys to drive. Nuke Train is a shooter game which molds together the elements of bullet hell and tower defense games. The player controls an armed futuristic train and have to stand the ground against waves of killer robots. After each mission, you can upgrade your equipment to be able to face the ever increasing challenge. 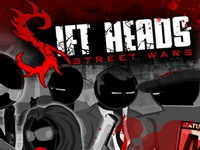 Action packed zombie FPS shooter with trophies, shoot your way through 10 waves of zombie assault and share your highscore. An intense overhead shooter featuring a robust 13-mission campaign, 4 unique minigames, and 9 solid weapons. Fight over 30 animated monsters, and take on 5 crazy bosses while competing over 6 leaderboards. Upgrade your weapons, buy ammo, armor and forcefields to survive and open more than 25 unlockables including 10 "hacks" to modify the game. Red balloons are obnoxious. Pop the red balloons, but free the blue balloons so they can safely float away. Take to the sky in an epic battle on the Northern Lights. Update your turrets and arm yourself with 20 different weapons and abilities. Might seem easy as first, but learn the tactics and get on-board to sweep 20 levels. And if you fancy some more action check out Infinite Mode for nonstop action. Collect bonuses, earn cash, level up, win the war on the Northern Lights. Darkest Days: Fight for human kind against an unstoppable horde of machines! An advanced AI created by scientists went terribly wrong when it started creating an army of drones to fight against us... Now it has taken over the galaxy and the last remaining planet under our control is being attacked. Earth is about to be destroyed! Killing zombies with bouncing bullets has never been this fun! Each level requires you to kill all of the zombies with a limited number of bullets. This games all about the survival, though some levels require a bit more than just that. Its all very arcade, with its password save and score oriented gameplay, but that's how we like it.. Have Fun playing it! There's no real trick to it, but the later levels will challenge even the best of you. In this new game series you will find the same bloody violence and story style you're used to, but with a totally new 3D environment. In this prologue of Street Wars Vinnie is confronted with all 3 organizations on his back, the Italians, the Yakuza and the Russians. Play the game and find out what happens.